Aman was founded in 1988 with the vision of building a ‘collection of intimate retreats with the unassuming, warm hospitality of a gracious private residence’. The first, Amanpuri (place of peace) in Phuket, Thailand, introduced the concept, and since then, Aman has grown to encompass 31 hotels and resorts. Following the successful launch of Aman Wellness in 2016, the elite wellness brand has launched ‘Private Jet Wellness Journeys’ taking place across the collection’s meditative and remote locations – in line with a growing demand for uber-luxe wellness experiences. 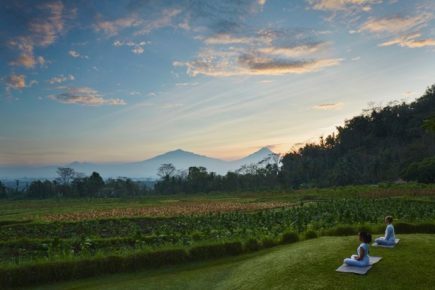 Headed by globally celebrated health specialists, the retreats invite guests to combine life-changing travel experiences with wellbeing journeys, designed to restore a sense of peace and invigorate mind, spirit and body. Private Jet Wellness – Journey 1: Wellness trailblazer and founder of the Yamuna body rolling method, Yamuna Zake will lead guests on a body and mind balancing private jet adventure across Asia. The 16-day journey through Indonesia, the Philippines and Vietnam will open doors to cultural and spiritual discovery whilst delivering profound health benefits. Guests will discover Bali’s creative and traditional heartlands, Amandari and Amankila; the majestic site of Borobudur from Amanjiwo in Java; become marooned on a tropical private island in the Philippines at Amanpulo and relax on the shores of Vietnam’s dramatic coastline at Amanoi. Along the way, Yamuna will lead a wellness programme tailored to each of the 16 guests’ requirements, including Pilates, yoga, breathwork, footwork and body rolling. The Yamuna method is a movement practice incorporating specially designed equipment to work the joints and muscles to promote health and wellness at any age. Guests will receive their own Yamuna kit of essential apparatus, including different-sized balls for body rolling. At the end of their journey, guests can expect to feel empowered to take care of their bodies and a sense of freedom in their movement that they never imagined possible, returning home feeling youthful, energised and happier. Private Jet Wellness – Journey 2: Guests partaking in this journey will travel by private jet to India, Sri Lanka and Thailand on a 14-day adventure to discover some of Asia’s most fascinating destinations while investing in their own wellbeing. Led by the founder of the Garuda Pilates Method James D’Silva and Eyal Chehanowski, a structural Integration (Rolfing Method) expert and yoga specialist, this wellness journey across Asia – both physical and spiritual – combines a personalised programme of yoga, and Garuda Pilates, which incorporates the spirituality, Pranayama and Asana practice of yoga, the core focus of Pilates and the balletic grace of dance to achieve a stronger, more flexible, toned body. Cultural experiences and incredible wildlife encounters complement the wellness activities and include a tiger-spotting safari in Rajasthan at Aman-i-Khas; an immersion in Sri Lanka’s unique colonial past at Amangalla and the country’s wild southern coast and national parks from Amanwella’s breezy coastal setting; culminating at serene Amanpuri, located on a secluded beach in Phuket.